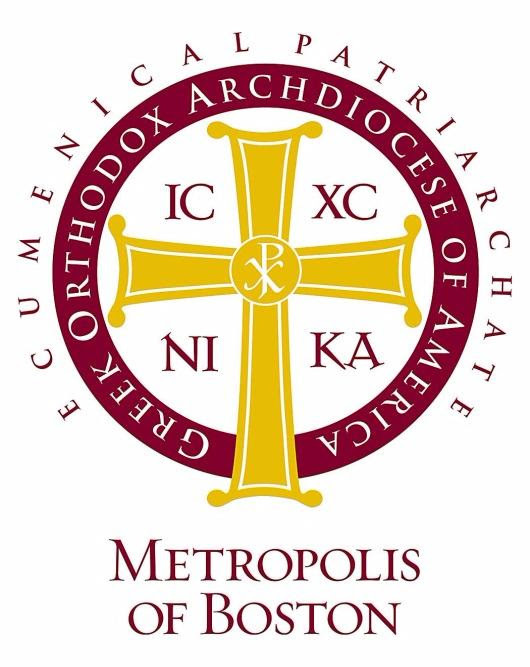 The Clergy and Laity of the Metropolis of Boston express their love and prayers of gratitude to His Eminence Metropolitan Methodios today, on the 35th anniversary of his enthronement as our Chief-Shepard and Hierarch. 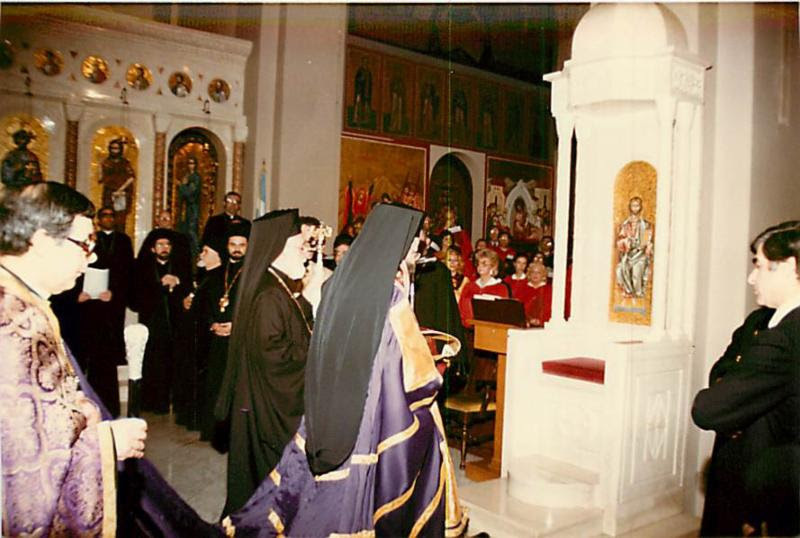 Metropolitan Methodios was enthroned on April 8, 1984 by His Eminence Archbishop Iakovos of blessed memory at the Annunciation Cathedral of New England. We pray that the Lord will grant many years of good health to our Metropolitan as he "rightly teaches the Word of Your Truth". AXIOS!! "I come to you not as a renowned theologian nor an administrator or preacher of repute. I come, honestly I do, as a spiritual father, as a brother, as a friend, as a servant. I came to you with much trepidation, aware of the awesome responsibilities I assume as your Bishop." 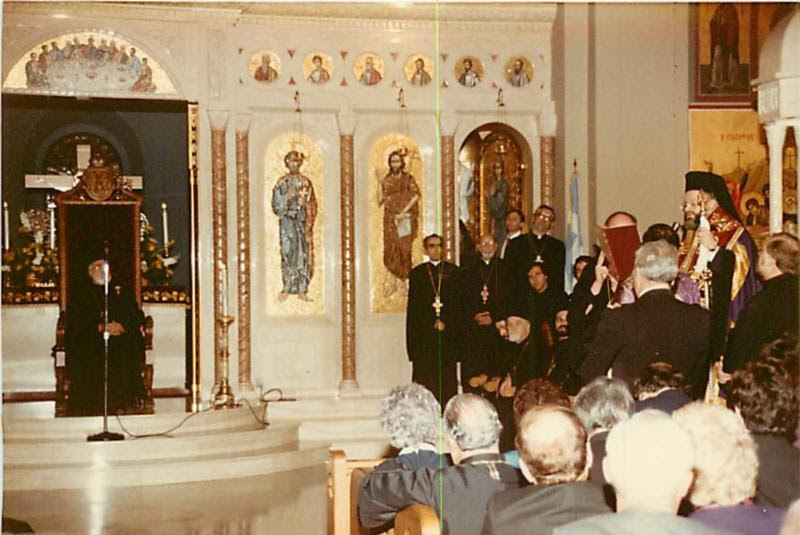 May I express the great debt I feel to my spiritual father, Archbishop Iakovos, for the paternal love and encouragement he has so abundantly shown me throughout my life in the Church, and for the great trust he manifests in me as I assume this most important ministry. 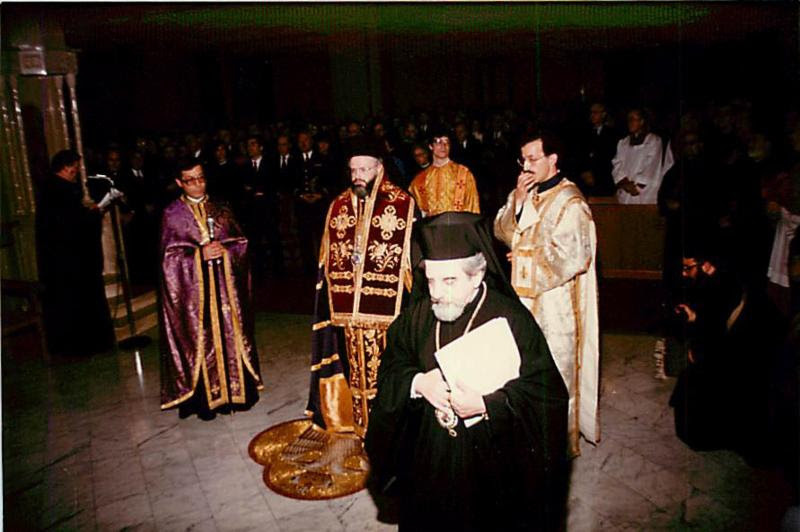 Whatever I am in the Church I owe to God and to Archbishop Iakovos. I express a vow of fidelity and assure him that I will seek his inspiration and direction that this Diocese may grow and progress for the glory of Almighty God. I am most thankful to Metropolitan Silas of New Jersey, no stranger to Boston, having served with distinction the parish of St. John during the years when our Archbishop was Dean of this cathedral. I am grateful to the members of the Synod of Bishops of our Archdiocese and the Holy Synod of the Ecumenical Patriarchate for electing me Bishop of this historic Diocese of Boston. I am most happy that my brother auxiliary Bishops are here from New York and pray that God continues to inspire their ministry. I thank also my brother priests who have traveled from afar to be with me this evening. I am grateful to the Dean and members of the Parish Council of this Cathedral, the members of the Diocesan Council, the Diocesan Philoptochos Board, the President, the Deans, the faculty, the staff and the students of our college and seminary. To all the priests and laymen representing the communities of the Diocese. To my co-workers at the Archdiocese and all my friends from New York and throughout the country for participating in this service and sharing my joy. I am very fortunate as I begin my ministry here to have the support of two bishops that I have always respected. I will call upon both Bishop Gerasimos of Abydos and Bishop Demetrios of Vresthena for their advice and counsel. I thank Bishop Gerasimos who, ably assisted by Fr. Karahalios, lovingly and competently directed this Diocese these past few months. 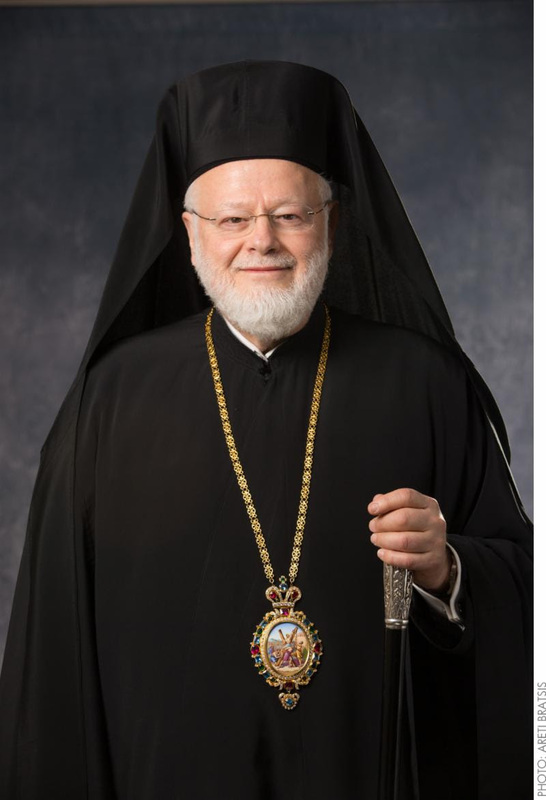 I extend my wishes to my predecessor, Bishop Anthimos as he ministers the Diocese of Denver. Finally I express my gratitude to the civic and Ecumenical leaders who honor me with their presence. 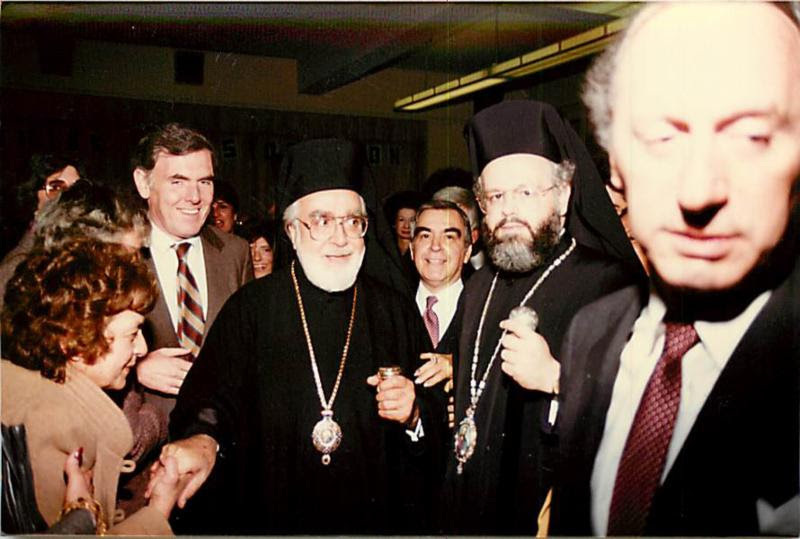 I have a mandate from Archbishop Iakovos to foster close civic and ecumenical ties in this city and throughout the Diocese, and manifest the presence and contribution of Orthodoxy in a most positive and meaningful manner. May I especially recognize a new friend, a most respected Hierarch, His Excellency Bernard Frances Law, the newly appointed Archbishop of the Roman Catholic Church in Boston. I beseech the Lord’s strengthening hand and your prayers as I ascend the beautiful throne of this majestic Cathedral. As beautiful as it is, it is not this throne that I seek to occupy, but the one which graces your beautiful hearts. “Let no one despise your youth, but set the believers an example in speech, in conduct, in love, in faith, in purity”. (1 Tim. 4, 12). I come to you bearing what God wants me to share with you abundantly: His love. I invite you together with me to take stock of our lives. Of the parishes where we worship; the world in which we live. Let us assess the present realities with honesty and face courageously the critical issues of faith and life. As we stand at this moment in history, let us be concerned with the unchurched. Those who sit on the periphery peering in to see whether we have anything to say to them. Whether we assist mankind in relating the reality of God to the reality of life. Whether holiness and sanctity can ever converge with the endless struggle to survive. Whether the evangellion is indeed “the good news for modern man” which can touch and radically transfigure life today. God has become superfluous and an encumbrance to the secular mind which recognizes only the deity and power of man. The religion of God who became man is confronted by the religion of man who makes himself God. The Church must never resign itself to this spiritual tragedy. Together, let us confront it courageously. The congregations we serve in this Diocese---indeed the entire Archdiocese in 1984---vastly differ from those of the 1960s and 70s. 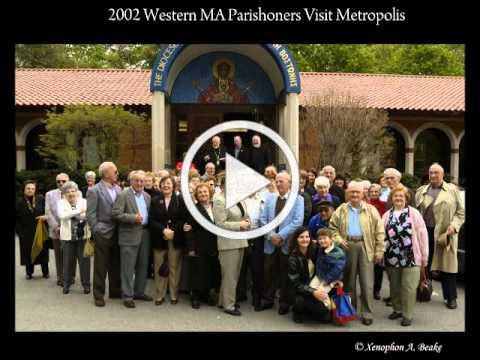 The constituency of our parishes is rapidly changing day by day. So are the attitudes in America. I often wonder whether our nation, whose coins bear the stamp, “In God we trust” really does. Banning prayer from our schools, passing legislation legalizing abortion, and in general giving more attention to the nuclear race than the human race is not trusting in God. Recently, U.S. News and World Report featured a story entitled “Ten forces reshaping America today”. Isn’t it sad that religion was not among the ten? Can we as individuals, clergy and laity; can we as parishes, as a Diocese, an Archdiocese capture the reality of the early Church described in the Book of Acts. A Church animated by the creative power of the Holy Spirit. Can we imitate the early Christians who celebrated their identity as a worshiping community? We read in the Book of Acts, “They were filled with the Holy Spirit. They spoke the word of God with boldness (4:31). And the fruits of this faith and grace was service. St. Luke testifies, “none of the members was ever in want”. (4:35). Brethren, I entreat you. Let us not be parochial in our outlook, but let our vision carry us far beyond the boundaries of our parishes and the borders of this Diocese to see the needs of the “least of our brethren”. Let us be more sensitive to the tragedy of abandoned and abused children, to the thousands of homeless in our midst, of those who go to bed each night with little or nothing to eat, of those who die of starvation around the world, of the innocent unborn criminally and inhumanly deprived of the light of day, of the countless that live the tragedy of loneliness and despair, of the spiritually wounded men and women rendered hopeless by our insensitivity, indifference and betrayal. Let us give our attention to our young people struggling to find their niche in life; and to our senior citizens who labored to bequeath to us what we enjoy today. Let us reawaken our missionary zeal and go to our neighborhoods, to our hospitals, to our colleges and to our own families, and seek all those who like Zaccheos the tax collector climb the sycamore tree of Hope seeking direction and salvation. “What does it profit a man to win the whole world and lose his soul? What can a man give in return for his soul? (Mark 8:37-38). Let us make a concentrated effort to integrate our Faith in our lives. Ours is not a blind faith, but the powerful light of the Divine truth. It is the celebration of sanctified humanity. It is life in Christ, embraced by His love. It is enhanced, supported, and defined by the presence of the Holy Spirit. Let us resolve tonight and always to rekindle within ourselves and our parishes that pristine spirit of faith, love and service so characteristic of the Apostolic Church. For we who are gathered at this Cathedral tonight are the successors of the Apostles, a pilgrim church, a community of men and women united in Christ, led by the Holy Spirit, journeying to the Kingdom with a special mission to “go and make disciples of all the nations”. To proclaim that in the person of the Church---its Clergy and Laity---the Lord lives ZH KYRIOS. That He walks the streets of our cities and towns seeking to save the lost. Let us proclaim that faith through our words, through our deeds, through the celebration of our sacraments. Let us proclaim the sovereignty of Christ. Let us trust in His Providence.